Remastering Sounds in "The Majesty of Colors"
Written by Melissa on Dec. 17, 2016 in Development. As we remaster the audio, we have to consider not only what will sound good on headphones or a PC's speakers, but also a phone or tablet's speakers. We'll test on as many devices as we can reasonably get our hands on—this is our first mobile game, but we know how audio can make or break a game on phones just as much as on desktops. 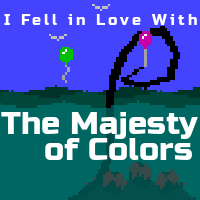 "The Majesty of Colors" is slated to come out early 2017 for PC/Mac/Linux and iOS and Android devices. Exploit: Zero Day is our cyberthriller with a living story. The first season of content, "Headless Swarm," will get you instant access to the closed alpha, or you can join the mailing list. and receive an access code to the free story in the next monthly newsletter. YouTubers, streamers, and press, request a copy from distribute(). Our first release, Ossuary is available on Steam, itch.io, Humble, and IndieGameStand. Press-like people, you can also request a copy of Ossuary from distribute(). Last update on Dec. 17, 2016 .